Shanghai Public Transportation Card (SPTC) (上海公共交通卡; www.sptcc.com; CNY20 deposit; up to CNY1,000 credit) is a contactless smart card, which can make usage of the public transportation in the Shanghai much easier. This multi-usage card can be used in all forms of public transport, including metro, bus, taxi, ferry, and Maglev. It can also be used for paying parking, highways, and at gas stations. SPTC can be purchased and recharged in multiples of CNY10 on all MTR stations, convenience stores, and branches of Bank of Communications, Shanghai Pudong Development Bank. You will get 10% discount on metro fares if you spend more than CNY70 within one month. The card can be returned and balance with deposit taken at some metro stations, including Hanzhong Road, Hengshan Road, Jinjiang Park, Jiangsu Road, Nanjing East Road, Dongbaoxing Road, Zhenping Road, and Yangshupu Road. If balance is greater than CNY10 when returning card, 5% of the balance will be charged. There are two airports in Shanghai, Pudong International Airport (PVG) and Hongqiao International Airport (SHA). 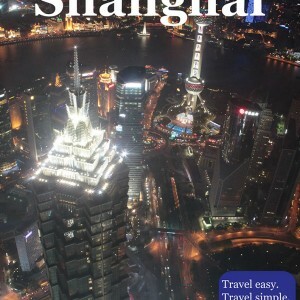 Pudong International Airport (PVG) (上海浦东国际机场; en.shairport.com) is main air hub in Shanghai. It is located 30km (19mi) east of Shanghai’s city center. Most of international and domestic flights in Shanghai are from/to this airport. You can go to/from this airport by metro, Maglev train, bus, and taxi. Metro Line 2 connect Pudong International Airport and Hongqiao International Airport, and pass through several centrally located and important MTR stations like Lujiazui, East Nanjing Road, People’s Square, West Nanjing Road, Jing’an Temple. Metro station in PVG is located between Terminal 1 and Terminal 2.Trains operates between 6:00 and 22:00, on every 8.5 minutes, or even less during rush hours. Ride between PVG and city center takes about 70-80 minutes, while ride between two airports (PVG and SHA) takes about 100 minutes. Ticket cost from CNY3 to CNY9, depending on distance (CNY3 for city center, CNY8 for Hongqiao International Airport). Time-saving and money-consuming Shanghai Maglev Train (上海磁浮示范运营线; www.smtdc.com; CNY50/80 single/round trip for economy class; CNY100/160 single/round trip for VIP class) is definitely most attractive way mean of transportation from/to Pudong International Airport. This high speed train reach up to 430km/h speed, proving that even trip to/from airport can be fun. It operates between Pudong International Airport and Longyang Road Metro Station in Pudong. Maglev Train departure from PVG between 7:02 and 21:42, and from Longyang Road Metro Station between 6:45 and 21:40, on every 15 or 20 minutes. Trip takes about 8 minutes. On Longyang Road Metro Station you can make transfer to metro line 2 or 7. There are 6 shuttle bus lines between PVG and city. Buses run from both, Terminal 1 and Terminal 2, usually between 6:35 and 23:00, on every 15-25 minutes. Bus trips usually takes from 60 to 90 minutes depending on distance and traffic. Taxi is also very good option to reach PVG, but most expensive too. There are taxi stations in Terminal 1 and Terminal 2. Taxi ride between PVG and city center usually takes about one hour, and cost about CNY140-160. Hongqiao International Airport (SHA) (上海虹桥国际机场; en.shairport.com), older of two Shanghai’s airports, is situated 13km (8mi) west of Shanghai’s city center, and 60 km (37.3mi) from Pudong International Airport. Metro Line 2 (SHA-downtown 5:35-22:50; downtown-SHA 6:05-23:38; on every 8.5 minutes) and Line 10(SHA-downtown 5:56-22:01; downtown-SHA 6:36-23:01; on every 8-13 minutes) connect Hongqiao International Airport with downtown. Line 10 have stops at Terminal 1 and 2, but Line 2 have stop at Terminal 2 only. Check Metro Line 2 paragraph in Pudong International Airport section above for more details about this line. Line 10 have few important stops, including Changshu Road, Shaanxi Road South, Yuyuan Garden, and Nanjing Road East. Ticket on Line 2 cost from CNY3 to CNY9 (depending on distance), while ticket on Line 10 have a fix price CNY6. There are shuttle buses running from Terminal 1 and Terminal 2 to the downtown and back. Operating hours are usually from 6:00 to 22:00. From Terminal 2 there are buses 24-hours. Bus trips to the downtown usually takes about one hour (CNY6-8). Taxi ride between SHA and city center usually takes about half an hour, and cost about CNY60-100. Shanghai Metro (上海 地铁; www.shmetro.com) is the most popular form of transportation in Shanghai with both tourists and locals. Shanghai has a modern, safe and efficient subway, with very good network, and it is also cheap. Metro network in Shanghai consist of 14 lines with the length of 548 km (341 mi), making it the largest in the world. In the near future a new extension of the network of a few hundred kilometers is planned in order to extend the existing network. With the metro, you can reach any attraction in Shanghai. Singe ride fares range from CNY3 to CNY10 depending on distance. For rides between Shanghai’s main attractions tickets usually cost CNY2-4. You can also buy one day (CNY18) or three days (CNY45) metro ticket at metro stations. After you use it, you don’t have to return either of these tickets. There are thousands of taxis (出租车; chūzūchē) in Shanghai, and they are cheap. Usually, drivers will use meter, but if they not find another taxi. Make sure you have your destination written on Chinese, because very little taxi drivers speak English. Flag-fall rate is CNY14 for the first 3km (1.9mi), after that CNY2.4 will be added on every kilometer up to 10km (6.2mi), and CNY3.6 will be added on every kilometer after first 10km. CNY1 fuel surcharge will also be charged. During the night (from 23:00 to 5:00) flag-fall rate is CNY18 for the first 3km (1.9mi), after that CNY3.1 will be added on every kilometer up to 10km (6.2mi), and CNY4.1 will be added on every kilometer after first 10km. CNY1 fuel surcharge will also be charged.